Remember this challenge is called Commit 2 Fit and we are here to change habits! Let's start this week's habit with some fundamentals and basic understanding of weight loss. For many of you this will be review and for some brand new. The first column on the left (in turquoise) shows an example of how much you ate in calories - let's say 1500. Then your body burns 1500 calories for the day (2nd column) - that would mean a weight maintenance. Remember everyone has a different metabolic rate, but with this challenge we are trying to develop these new habits that help increase your metabolism. 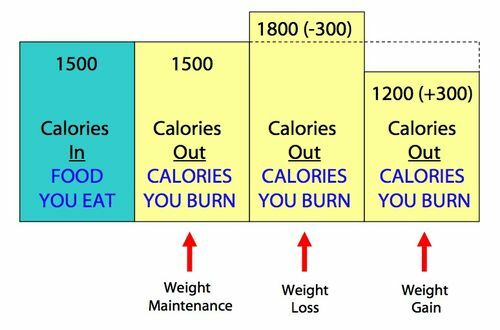 What happens when you burn 1800 calories? The second scenario - you are going to lose weight! You are going to burn up some body fat - the body is going to be looking for that 300 calories to burn away. 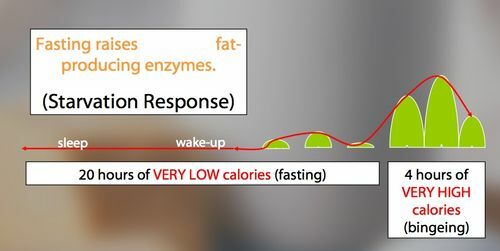 This is another reason why I take the Catalyst so my body doesn't go looking for muscle to burn, it burns the fat first. Remember this is a generic number - bottom line what you put in your mouth, you have to burn off! The challenge this week: You are going to eat a small meal every two to three hours. This life habit that we are going to implement this week is VERY important for your overall results. Some of us are really going to see some results when you start this! What is a small 300 calorie meal? 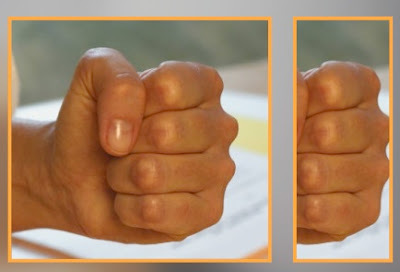 Make a fist - a fist and half is a good general rule of portion size, it is about 300 calories. We are going to follow the fist and half portion for this challenge not the two fists. Half Turkey sandwich (light insides - have you tried the Orowheat double fiber english muffins? Vegetables are considered the 'free' food and don't count in your 'fist' portion size. What really impacts your calories are butters, dressing, sauces, etc. Use light versions or very little of these. Please share your ideas for these small meals - we are going to need them over the next seven weeks we have left! What does a typical day look like? Based on this graph I am definitely in the 'typical' range. So this will be a good challenge this week to get me to change it up to the ideal scenario! It is very important to have your meal within an hour of waking up - you need to eat! You have to start in the morning if you are going to continue to eat these small meals throughout your day. Plus it is a great way to jump start your metabolism in the morning - your body will start burning calories immediately. Do not deprive your body. You can see how your blood sugar is going to stay even/stable throughout the day. That is what we are looking for. In the green you can see how most of us eat - notice first thing in the morning we sabotage our weight loss by not eating anything until 9am. But when dinner time comes around we are STARVING and we eat even more after dinner because we deprived ourselves all day. 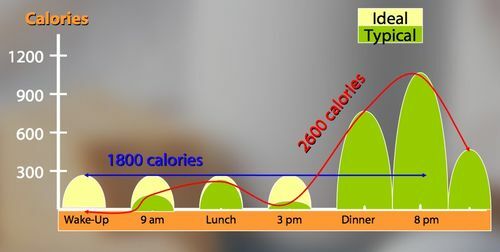 Look at the calorie intake of the ideal situation versus the typical in this example. The 'typical' example is actually called the SUMO Wrestler diet, believe it or not. I don't think any of us are going for that look on purpose! How do you keep your metabolism burning HIGH all day? 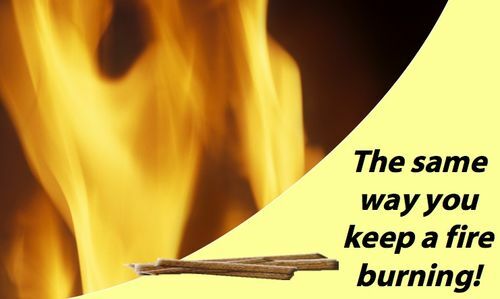 Think of the twigs that you toss on the fire to keep it going as your food. So we have to be giving our metabolism small amounts of food to keep it going. You are probably thinking there is no way that I have time to eat 5 meals a day! I believe we need to change our perception of what a 'meal' is. It's not always sitting at a table, with a napkin and silverware. 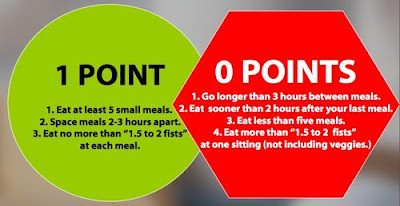 Most of us don't have time to do this - we need to look at these meals more as snacks and they are not going to be eaten in the perfect social environment every time. Plan ahead: write out a meal plan for each week. See the examples above. Make a grocery list and stock up on exactly what you'll need - feed your family this way too! Did you notice that most of your kids eat this way already?? At first, you might have to eat "by the clock" to break old habits, especially during the first half of the day. Because if you are eating those big meals at dinner/night you are not going to wake up hungry - your stomach probably hasn't even finished digesting it. When you even out your calories you are going to wake up hungry. A good rule of thumb is you need to at least have half of your small meals in before 2pm. Make a note of this somewhere - set it on your phone or your computer calendar. Remember to either post your last weeks points here in your comments or send them to me privately at paulamw@mac.com. If you don't want your results posted on the blog PLEASE let me know! Also there are 14 possible points this week - one for the water and one for the small meals. 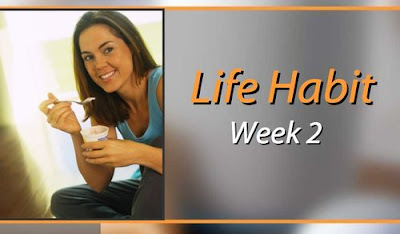 This challenge builds upon itself each week.